In a presidential campaign that has been anything but predictable, strategic and organized, Donald Trump has finally put together a surprisingly strong branding strategy for the Republican National Convention. And then watched it blow up. The Trump campaign and the RNC have gone to great lengths to brand each day of the convention with an overarching platform central to the Trump campaign. In marketing and branding parlance, the Trump camp and the RNC are very shrewdly appealing to personal core values: keep me safe, save my job, save my country, united we stand. The clear goal is to reinforce these core values to build to the Trump brand promise of strong leadership to strengthen America. Trump himself had already been ramping up his social media rhetoric in preparation for the first convention day’s core value of ‘keep me safe.’ He especially used the Baton Rouge police shootings as a Facebook call to action. On Twitter the day before the convention he also tried to weave the threat from ISIS into the narrative. But Trump’s marketing team has also been proactive and smart in making sure his social media messaging has tied directly into the core value agenda. Each day on Facebook the team has posted branded content reflecting the day’s agenda and inviting followers to engage. Monday’s theme of ‘keep me safe’ brought several posts throughout the day of videos and images for viewers to share. On day two, the core value of ‘save my job’ was addressed directly by Trump himself on Facebook. It’s a smart tactic to keep Trump’s own words in the public dialog of his followers as they await him to address the convention on Thursday night. But even the best branding can’t overcome the push of a campaign’s own mistakes and the pull of the news media and social media in off-message directions. 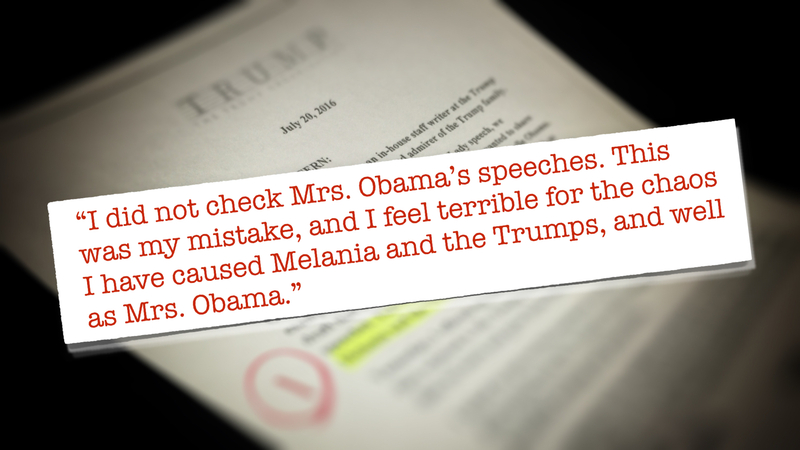 Case in point is the speech of Melania Trump on the opening night of the convention. The allegations of blatant plagiarism from Michelle Obama’s 2008 speech at the Democratic National Convention are damaging at best. The side-by-side split screen compiled by CNN and other news outlets is a communications management nightmare for any organization. Even worse, was the campaign’s denial and refusal to address the issue. If there’s any lesson for communicators in the 21st century it is that you have to work at the speed of news. The complete 20-hour vacuum of activity on the GOP convention floor and the virtual silence from the Trump campaign is deadly in the world of 24 hour news. What the campaign organization doesn’t help fill, the news media and social media will fill for them. And that’s exactly what led to the heated confrontation between CNN anchor Chris Cuomo and Trump Campaign Manager Paul Manafort where Cuomo called him a liar. The incident shows that the best branding and communication efforts also must constantly plan for the contingencies of crisis communication. In this case, Malania’s speech slipped through the cracks of an otherwise seemingly disciplined RNC communications team and it raises serious questions about the competence of the Trump campaign. Effective crisis communications calls for an immediate response, often times an immediate commitment of an organization to cause no more harm, and dare I say it—apologize. Ms. McIver did. We know that publicly such a word is rare in Mr. Trump’s vocabulary. Ignoring the issue while waiting for the next news cycle is not a crisis communications strategy. Responding sooner would have allowed the campaign to get back on track with the smart branding of his convention. But it may also leave lingering questions with voters about how he may make decisions as president in more consequential crisis matters.